Robin and Angus at the Celtic Football Club in Glasgow. The EuroChampsChallenge is a unique charity challenge set to achieve something nobody has ever done before. Covering 7,000 miles visiting 21 football clubs through 16 countries in only 14 days and in aid of 2 extremely deserving charities by 1 very driven team. Inspired by a remarkable seven-year-old boy, the team aim to raise £100,000. We have devised The EuroChampsChallenge, a challenge to visit every ground of every team that has ever won the Champions League - and its predecessor, The European Cup. 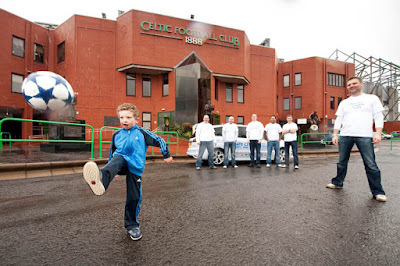 We will start at Celtic Park in Glasgow at 9 am on Sunday 15th May 2011 and in the following 14 days will travel 7,000 miles visiting 21 clubs from 20 cities travelling through 16 different European countries. The biggest part of the challenge is to try and meet a winner from each team – a Medallion Man – at every ground. If all works out we will finish at Wembley on the 28th May only hours ahead of the 2011 Champions League Final. With 21 autographs. It has been some time since I last tried to raise money for charity - November 2000 whilst working at CBRE. Brian Skinner persuaded me to shave my head in aid of Children in Need. I did. While the funds raised were fantastic, the resultant image that I saw in the mirror shortly after left me so self-conscious and embarrassed that I vowed never to do anything as dramatic again. Ten years on, and about to embark on the biggest challenge of my life, I remember well trying find an appropriate hat to hide my head before I left the house in the morning. I remember being very conscious of people looking. I remember feeling the need to justify my appearance to almost everyone I met. My 6 year-old son, Angus, was born with only one ear – a condition called microtia. From birth he has looked ‘different’ He already has to deal with people staring and he has already had to answer questions about his appearance. The microtia has come with additional problems and as a result he has been a fairly frequent visitor to the Sick Kids in Edinburgh. He has had numerous appointments, examinations and operations. His foreseeable future will continue in the same vein. But he doesn’t look for a hat before he leaves the house. Nor does he grow his hair to hide anything. Don’t feel sorry for him, there’s no need. I’m a firm believer that in life you are defined not by what happens to you, but how you react to it. And in this respect, Angus is an inspiration; he is bright, cheery, and resourceful. He’s faced all he has had to endure with courage and resilience. He’s inspired me to do something unique. He’s inspired me to do The EuroChampsChallenge. The two charities we are raising funds for have been tremendously supportive. Changing Faces is a charity set up to help those with disfigurement – however acquired – to deal with all life may throw at them; the Sick Kids Friends Foundation in Edinburgh ensure that whatever the reason for a child visiting them, there is at least some element of fun or enjoyment. We are forever grateful to these two organisations, and recognise that we will need them more in the coming months and years. It’s my turn to give something back. Please take some time to visit www.eurochampschallenge.com to learn a little more about our adventure. 1. Go to virginmoneygiving and donate a £quid. Or a couple of £quid. Donate what you think we deserve. If that’s too much then donate what you can afford. 2. If you think this is worthwhile, please pass on The EuroChampsChallenge to friends and family who might share an interest. 3. Help us spread the word around the world. Thank you for reading, and I hope you feel that this is a worthwhile cause to support. Oh, and spare a thought for Brian. His hair never grew back. The confirmed Medallion Men include Jim Craig at Celtic, Alan Kennedy at Liverpool, Paddy Crerrand at Manchester United, Kenny Burns at Nottingham Forest, Wim Jansen at Feyenoord, Lars Ricken at Borussia Dortmund, Bernd Wehmeyer at Hamburg, Gerd Muller at Bayern Munich, Helmuth Duckadam at Steaua Bucharest, Robert Prosinecki at Red Star Belgrade, Franco Baresi at AC Milan and Luis Suarez at Inter Milan. Robin, thank you very much for sharing this inspirational story and intriguing initiative. All the best wishes to Angus, you and your team.